The majority of individuals think skin cancer will never affect them. The truth is, anyone and everyone can be diagnosed with skin cancer at any time. In fact, skin cancer is the country’s most common form of cancer. The purpose of this article is to increase skin cancer awareness. At Arizona Dermatology, we believe that how to identify the common types of skin cancer and taking preventative actions are tools you can use to potentially save your life. When it comes to skin cancer, being knowledgeable is key. Here we want to inform you of the various types of skin cancer, as well as the risks and treatments for each type. You may be more at risk to a certain type of skin cancer over others based off of varying factors. Because of this, it is crucial for you to fully comprehend the three most common types of skin cancer: Basal Cell Carcinoma (BCC), Squamous Cell Carcinoma (SCC) and Malignant Melanoma. Basal Cell Carcinoma, when detected in its earliest stage, is treatable. One treatment that offers the highest cure rate for skin cancer is Mohs Micrographic Surgery (Mohs). Mohs surgery involves strategically removing the cancerous tumor, layer by layer. Some advantages to this surgery when performed by Arizona Dermatology, include receiving your results the same day as your procedure and knowing you’re cancer-free upon leaving your appointment. Should you choose to treat your skin cancer with Mohs Surgery, we ask you to schedule appropriate follow up appointments to help monitor the progress of your treatment. If Squamous Cell Carcinoma is detected within its early stages, treatment is available. Like BCC, the most beneficial action for combatting SCC is prompt removal through Mohs Surgery. Mohs Surgery has the highest overall cure rate of about 94 to 99 percent for SCC and has been noted to be the most cosmetically pleasing surgery you could have, leaving little to no scaring. To determine if this treatment is right for your condition, schedule an appointment with your dermatologist today. The final type of skin cancer we’ll cover is Melanoma (also called Malignant Melanoma). Melanoma is considered one of the most common forms of skin cancer and is widely recognized as the most dangerous type, responsible for approximately 75 percent of all skin cancer deaths. The majority of individuals categorize Melanoma as impacting people strictly through abnormal moles on the skin. While this is true, Melanoma can also impact other areas on the body. When allowed to spread, Melanoma can become life-threatening. Because of the severity of this type of cancer, treatment for Melanoma is best diagnosed by your dermatologist. Contact an Arizona Dermatologist right away if you see any abnormalities, growths, or changes anywhere upon your skin. Who is Most Susceptible to Skin Cancer? Now that we’ve fully covered the three most common forms of skin cancer, let’s take a look at the varying influences that impact your vulnerability to this disease. Below are the overarching factors that heighten your risk of being impacted. According to most beauty articles “age is just a number.” However, in the case of skin cancer, this concept unfortunately does not apply. Older individuals have a greater chance developing any form of skin cancer because they have been around longer, and thus, have likely been exposed to the sun for a longer period of time. Skin pigmentation helps to combat skin cancer, which is why lighter skinned populations, such as Asians or Caucasians, have a higher chance of developing skin cancer over naturally dark-skinned populations. In addition to the lack of skin pigmentation, individuals with freckles, moles, or a prior history of long-term sunburns become more susceptible to this disease. As noted throughout the differing types of skin cancer, having red or blonde hair in addition to blue or green eyes heightens your risk of possessing skin cancer significantly. Why you ask? Lighter colored hair and eyes produce less natural protection against the sun’s ultraviolet rays, causing more sun damage to the corresponding regions of the body. If you were, at any point, a victim to skin cancer, it’s important to track any changes to your skin in case the cancer were to ever develop again. If you possessed non-melanoma skin cancer within your lifetime, you are at 10 times higher risk for developing it a second time. It is crucial to become knowledgeable about your family history of skin cancer. If your parent has or had SCC or BCC, you have a 2 to 3 times higher chance of getting it yourself. Skin types, of course, run within families. Fair skinned families are at a higher risk of possessing skin cancer as compared to dark skinned families. Sun exposure of any kind—indoor or outdoor—will increase your risk of being diagnosed with skin cancer. Additionally, individuals who live in sunny locations such as Arizona, or those who work outside for extensive periods of time, impose a higher risk. Skin cancer is not worth any risk. It’s important to remember that while some are at a higher risk for developing skin cancer than others, anyone can become a victim at any time. Because of this, preventative measures are relevant and important to everyone. Below are some tips that we suggest to all individuals to help decrease the risk of developing skin cancer. Still Have Questions or Concerns? Visit us at Arizona Dermatology! Do you notice any abnormalities on your skin? Are you at a high risk of developing skin cancer? Does this article raise concerns about your health? Don’t wait! 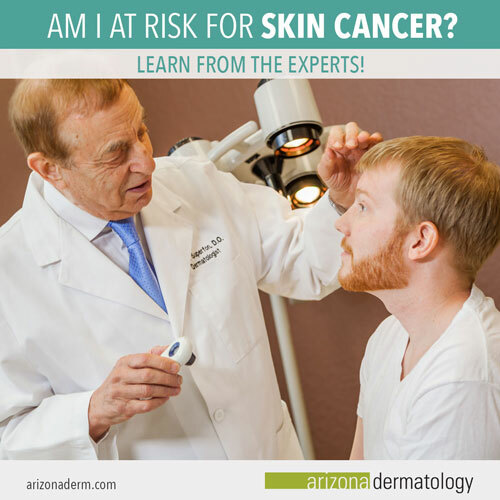 Contact Arizona Dermatology immediately to get any and all of your skin cancer questions answered. Schedule your appointment today at any of our seven locations throughout the Valley: Mesa, Paradise Valley, Phoenix, Show Low, Apache Junction, Coolidge, and Quartzsite.